Last week has been particularly busy for the financial markets due to the heavy issuance of government bonds, which included 9 billion euros of a new 10-year bond from Spain as well as bonds from France, Italy, Germany and Portugal. Even our little Cyprus has announced plans to sell a bond soon, over a year short of the initial predictions; a piece of news that I am sure was music to the eats of yield-hungry investors. However, all this is of little significance since a great event overshadows all the rest on the globe currently. Yes…you have guessed correctly…I am talking about the 2014 FIFA World Cup in Brazil, which has captured the interest, attention and passion of people all over the world, but its repercussions are felt much beyond the hearts of football lovers the world over. Besides the actual sporting nature, as a tournament it is a huge marketing and business venture which primarily helps the economy of the organizing country, due to the influx of tourists as spectators as well as due to the exposure it attracts in the world media. And although Brazil is making the news also due to the protests against the World Cup and the social unrest in its streets, it is also true that its currency, the Brazilian Real has appreciated significantly over the recent period against most other major currencies, such as USD. So immediately we see one way that the World Cup affects the forex and binary options online retail industries and how its duration could also be full of investing opportunities to be had. Another opportunity is revealed if one goes back in time where statistics show that the euphoria associated with winning the World Cup has meant that the stock index in the world champion country shows a significant increase in the first months at the aftermath of the final. Moreover, obviously the best trading prospect, in terms of forex trading would be to long the winner of the final and short the loser. When it comes to forex trading however, some problems arise because most of the top countries participating all have the same currency, the Euro, while others that could do well, such as Brazil or Argentina, have exotic currencies that not usually offered by brokers for trading. So, in terms of forex, it would be better if Australia, Japan, Mexico and England do well, since they all have currencies that are readily available via most brokers. Buying GBP would be a safe bet if the England national team does exceptionally well, but from the little I can gather about the game I don’t see this happening. Most bookmakers admit that betting goes up in terms of volume and money during the World Cup, since it is a period that even people who are not usually into the sport or even betting appear more willing to take their chance, and this does not only include men but women as well. So it is not just pubs or fast food delivery chains that see their businesses boom during the tournament, but betting offices as well. 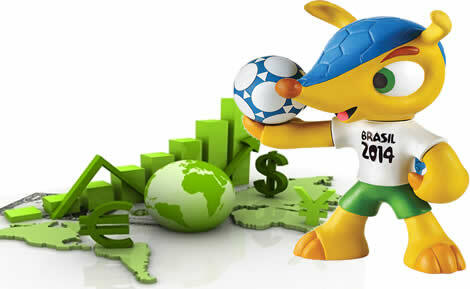 In addition, the host country of the World Cup Brazil, which is already an important jurisdiction in the forex and binary options industry has attracted even more brokers recently who wish to set up shop there for the first time or consolidate their existing presence, using promotional campaigns that are directly related to the World Cup. One prime example of this is the decision by MetaQuotes Software Corp., which is one of the leading names in Forex trading, who went on to open their first representative office in Brazil. Finally, industry events which coincide with the World Cup, such as the FXIC Conference in New York City, attempt to attract participants by offering live coverage of World Cup games alongside their proceedings, ensuring that attendees will not miss any of the football action. So, sit back enjoy the action on the football fields but as wise traders keep your eyes open also for the investing opportunities being created by the World Cup both for forex and for binary options trading. Have fun and good luck!